Muswell Hill Library was recently threatened with closure. After a huge local campaign, it was eventually kept open. This is the early history of what would have been lost. A great expansion of literacy occurred in the 19th century thanks to the work of Sunday Schools, charity schools and voluntary elementary schools. This was expanded further after the 1870 Education Act increased state provision of education for all. But where would all the books come from for children and adults to read? Initially the challenge was taken up by commercial lending libraries, often known as circulating libraries, which lent books to members of the public for a fee. 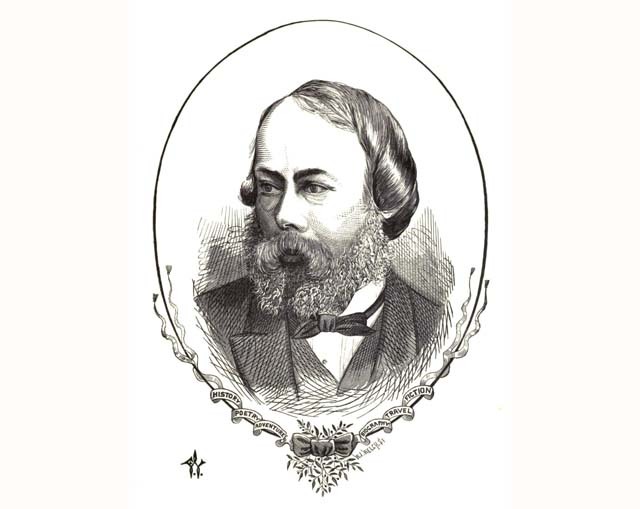 Charles Edward Mudie, who lived at The Limes, Muswell Hill, between 1867 to 1887, was the founder of Mudie’s Lending Library, which became one of the largest book lenders in the country. Along with Mudie’s main branches in London, York, Manchester and Birmingham, by 1895 there were small, circulating libraries, mostly connected to Mudie’s, at Hornsey, Crouch End, Harringay, Stroud Green, and Muswell Hill. It is also is one of those interesting coincidences of history that the site of his home, The Limes, should later become the home of Muswell Hill Library. While commercial libraries provided immense benefits, it was the provision of free public libraries which would be one of the great Victorian social reforms. The 1850 Public Libraries Act and associated acts consolidated in an Act of 1892 were intended to help working class people by providing them with a sober form of recreation and a chance to improve themselves. The Public Library Acts laid no duty on local authorities to provide a library service but enabled them to build libraries if local ratepayers were prepared to contribute to an extra rate (half a penny in 1850 and one penny from 1855). Often the building of libraries was aided by benefactors. For example, the steel magnate Andrew Carnagie (1835-1919) paid the £8,569 cost of building Wood Green Library (1907-1973) and he gave a £3,000 grant to Hornsey Borough in 1916 to aid its libraries programme. The Libraries Act was adopted in 1896 by Hornsey Urban District Council (UDC), largely through the efforts of Councillor Henry Burt who also played an important part in the acquisition of Alexandra Palace and Park by local authorities. As well as Henry Burt, the eventual building of a public library for the area owes some thanks to the builder James Edmondson, who created most of present day Muswell Hill. Edmondson had purchased The Limes estate and adjacent Fortis House in 1896, an area of some 30 acres, with the aim of developing a popular middle class suburb. To accompany the new houses, Edmondson had the shopping parades built and gave sites for nonconformist churches, a community centre (The Athenaeum now the site of Sainsburys supermarket), and a public library. The original site Edmondson donated in 1899 for the library was actually in Dukes Avenue, opposite the Baptist Church. Unfortunately Hornsey Borough Council was slow in building it due to insufficient funding through the rates, so in 1910 the site reverted to the donor and is now occupied by houses. In the meantime the residents of Muswell Hill had to use the Council library in Shepherds Hill or rely on commercial lending libraries. Fortunately, the rate limitation for libraries was abolished in 1919 and in 1930 the borough council decided to build a public library in Muswell Hill. The site they chose was in Queens Avenue. Part of that land had already been bought from Edmondson in 1898 at a cost of £35.4s.10p to provide for a fire station. The original site was small, with with a frontage of 27 feet and an average depth of just 26 feet. 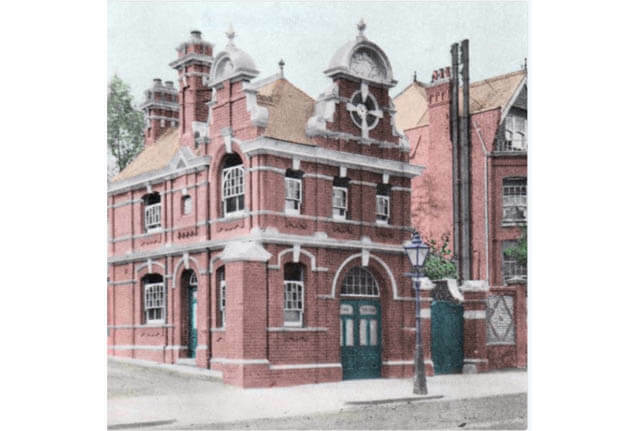 Costing £1,000 to build, the fire station had opened in 1899 consisting of a hose cart room, a fireman’s watch room, living accommodation, and a yard at the side. It had a relatively short existence. In 1926, with a new branch for the fire service opened in Fortis Green, the Council decided to use the station and yard as a Highways sub-depot. However, just a few years later that land would form part of the new library. Too small for its intended new use, it was necessary to extend the original site by purchasing two adjoining properties at a total cost of £1000. The Borough Engineer and Surveyor, W H Adams, designed a two storey building which could be shoe-horned into the irregularly shaped site with a narrow lane to the side. The unusual shape meant that the entrance hall was small. Estimated costs were £9,800, including fixtures and fittings. J G Faraday, the Borough Librarian, estimated the initial cost of books at £3,000. In March 1931 the council decided to purchase 815 volumes of classical works (£305) and 3,240 volumes of standard works (£1,343) for this library. At long last Muswell Hill had its public library. The new building was opened on Thursday, 15th October 1931 by the Mayor of Hornsey, Councillor C H Summerby. A reception at Tetherdown Hall marked the opening with speeches by the Mayor and by the Chair of the Libraries Committee. The Borough Librarian presented the Mayor with a bound volume of The Science of Life by Wells and Huxley, which had the Borough of Hornsey coat of arms on the front, in gratitude for all Councillor Summersby had done in the acquisition of the site. 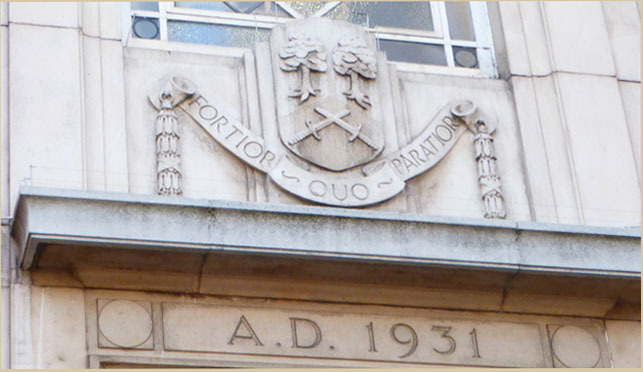 Hornsey’s coat of arms can still be seen above the main entrance of the building. This article was written by the late Ken Gay, past HHS President and historian of Muswell Hill, in the Library’s Diamond Jubilee year. It has been updated by David Frith. 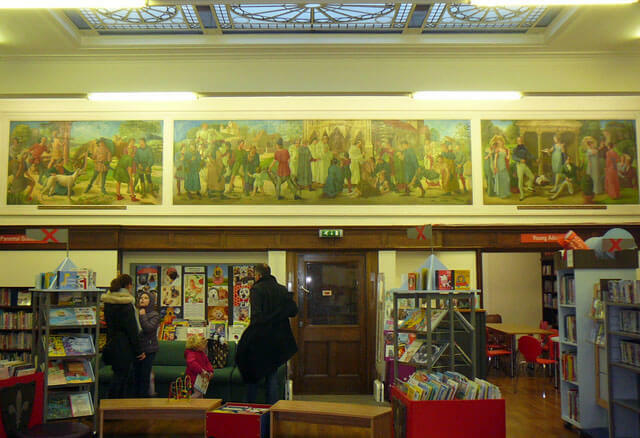 In 1938 the children’s library on the first floor was adorned by one of the earliest murals in a public library, painted by students of the Hornsey School of Art in Crouch End. The panels depict the history of Muswell Hill, particularly in the 12th century when the holy well, the Mossy Well, believed to have curative powers after a King of Scotland’s ‘cure’ there, acquired a chapel and lands under the care of St Mary’s Priory Clerkenwell and drew pilgrims to it until the Reformation in the 16th century. Muswell Hill Library went from strength to strength. By the 1990s staff had embraced a range of projects including a Toy Library which is still in use. However, clouds were gathering and councillors faced with the problem of balancing the books considered for the first time closing the library. From then on vigorous campaigns have been fought to keep it open. HHS Conservation Officer, David Frith, wrote a strong submission to Haringey Council in 2016 as part of the public consultation regarding the sale of the library building, which is statutorily listed Grade II as a building of architectural or historic interest (1994). 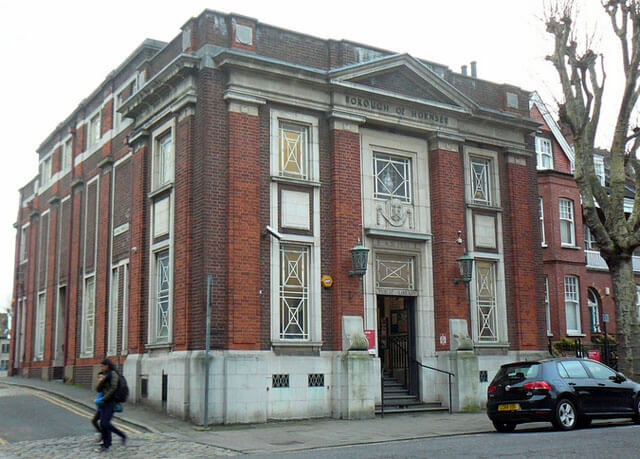 Most recently the campaign to keep the library open has been led by the Friends of Muswell Hill Library a community organization which supports the library and its users …. and they have succeeded against the odds! Photograph of Borough of Hornsey crest courtesy Eleri Rowlands.